Several non-contract carriers surpass the Big Four in satisfaction. For the second year in a row, T-Mobile ranks as America’s favorite full-service wireless carrier and Consumer Cellular ranks as the nation’s favorite non-contract wireless provider. The rankings come from a study of more than 8,200 consumers conducted by Market Force Information® (Market Force), and it also reveals trends in wireless plans, carrier performance, customer satisfaction and in-store experiences. For the rankings, Market Force asked participants to rate their satisfaction with their primary wireless carrier and its services, as well as their likelihood to refer that brand to others. The results were averaged to attain a score on the Composite Loyalty Index. Among full-service wireless carriers, T-Mobile ranked first for the second year in a row with a 43% score, and was the only one of the big four carriers to make gains over 2016. Verizon ranked second with 37%, AT&T was third with 32% and Sprint was fourth with 26%. [See Graph 1]. T-Mobile is the fastest-growing full-service provider in the country, and has been increasingly taking subscribers from Verizon and AT&T as it expands into more rural areas and sees strong uptake for its unlimited offerings. Among non-contract carriers, Consumer Cellular led by a clear margin for the second year, earning 73%. Straight Talk moved up one spot from 2016 to rank second with 55%, while Cricket dropped 9 percentage points and fell one spot to third with a 51% score. Virgin Mobile gained ground this year, moving from a seventh-place ranking to fourth place, while Boost Mobile maintained its place in fifth place. [See Graph 2]. Portland-based Consumer Cellular, which targets the over-50 market and is expected to earn $1 billion in revenue next year, also emerged as the overall leader when Market Force looked at the combined full-service and non-contract categories. Straight Talk, Virgin Mobile and Cricket also beat out the Big Four. [See Graph 3]. Market Force also ranked the Big Four across a number of attributes to learn what sets one apart from another. T-Mobile ranked highest for value, plan flexibility, ease of changing plans, new technology and store customer service, but lowest for frequency of dropped calls. Verizon was a clear leader for network coverage, call clarity & strength and least amount of dropped calls, while AT&T placed second in all of these categories. [See Graph 4]. Not surprisingly, Consumer Cellular, the overall winner in the non-contract rankings, took the top spot in every category but store customer service, an honor that went to Cricket. The top-three brands for value were Consumer Cellular, TracFone and Virgin Mobile. Straight Talk ranked second for network coverage and tied with TracFone for call clarity & strength. [See Graph 5]. Pre-paid wireless service has shaken its stigma and emerged as a viable option for consumers who want to save money and avoid contracts. In fact, Market Force found the number of those using pre-paid service has doubled, from 5% in 2016 to 10% this year, and TracFone and Straight Talk are the most prevalently used of the services. The study also revealed that just 56% of wireless users have a contract-based plan, a 6% drop from last year. 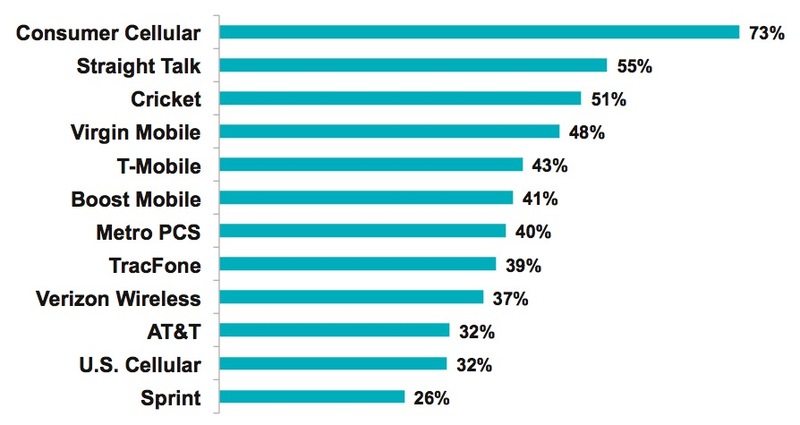 Market Force also found that physical stores are still very important for mobile users. Thirty-five percent report visiting a carrier’s physical store in the previous 90 days – 24% to buy a new phone, 16% to fix their phone and 15% to change their plan. Cricket’s associates received the highest ratings of all the carriers with physical stores, particularly in areas such as clearly explaining products, making appropriate recommendations, setting up features and solving problems. Forty one percent said they made a purchase during their last visit, and U.S. Cellular associates closed the most sales, with three-quarters indicating they purchased based on the associate’s recommendation. Market Force identified areas where providers could improve by analyzing wireless customer’s satisfaction levels. It found that they are least satisfied by their provider’s proactive approach in helping them manage their costs, the value they offer and data speeds. On the flip side, they’re most satisfied with how easy it is to understand their bill and access to new technology. [See Graph 6]. Even though users are increasingly shunning contracts, 78% have been with their carrier for at least two years, and most intend to stick around. Only 13% indicated they plan to switch providers in the next year. Of those, 66% said they would switch for better value, 39% for better network coverage. [See Graph 7]. “Consumers clearly gave a heads up to their wireless carriers that they need better service, whether provided by in-store staff, the call center or website content. When consumers are dissatisfied with service they are more likely to churn,” said Cheryl Flink, chief strategy officer for Market Force. Overall, more people use the Android operating system than the Apple operating system on their primary wireless phones – 50% compared to 43%. However, the tables are turned among early adopters. Of those who consider themselves early technology adopters, 52% use Apple and 47% use Android. The survey was conducted online in May 2017 across the United States. The pool of 8,231 respondents represented a cross-section of the four U.S. census regions, and reflected a broad spectrum of income levels, with 53% reporting household incomes of more than $50,000 a year. Respondents’ ages ranged from 18 to over 65. Approximately 72% were women and 27% were men.